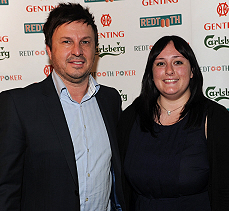 A change to the usual Redtooth Poker format saw the introduction of the first ever Redtooth Poker Semi-Final where the brand new Genting Casino in Sheffield, Genting’s flagship casino, hosted this exquisite event in what was a great day all round for poker fans! This event would see the top 10 players join the most sought after club in UK poker, the Vegas 100! Only 100 players from around the UK will be invited, no replacements, no transfers, simple! You are either there or you are not. Not there yet? You are missing out on something huge! 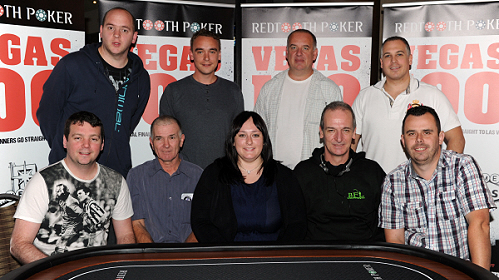 Top UK poker pro, Paul ‘ActionJack’ Jackson was in attendance for pre-tournament photos and advice. We also had the current UK Pub Poker Champion, Dean Dunkerley, who popped into his local casino to offer support to his potential successors. 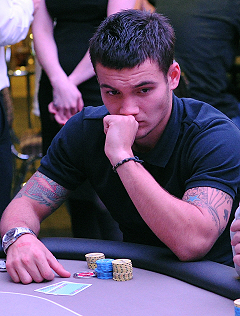 The tournament kicked off as the huge buzz around the card room was clearly evident. Daniel Long from the Beaumont Arms in Bolton was the first player out, lasting around 15 minutes. At least Bolton’s not too far from Sheffield! This meant the rest could settle down and get those chips and cards in the air. Several hours later we were down to the last two tables and we all knew we still had some way to go before we found our 10 winners. Another couple of hours passed as they slowly exited one by one, not leaving empty handed however as 11th-20th left with a home poker set consisting of a poker table, chip set and pack of cards and a consolation drink on Redtooth. At about 8:30 we reached the moment we were all waiting for. Lee Coates from the Durham Ox in Northallerton was all-in on the big blind for his remaining few thousand. As it turned out he picked up a decent hand in A-5 but unfortunately for Lee, he was up against 7-7. “No Ace” was the shout from a few excited players and after the board ran off without an Ace, a huge roar from all remaining 10 players erupted in a volcano of noise as the celebrations got under way! Lets meet the lucky 10…. *Unfortunately Tommy is under the age of 21 so will be unable to attend the National Final, therefore, he has received a cash prize.